I recently bought a 2008 Honda Accord LX that has 16" wheel covers. The covers were in bad shape with fading and chipping of the original paint. I didn't want to pay $40 for each new wheel cover so I bought about $30 worth of painting products and went to work. I decided to take the worst looking wheel cover and paint according to the following directions. The results were very good but time will tell how it wears. I used a silver basecoat and the results were a less brighter wheel cover which I prefer. However I would test the color on an old plastic trash can to see if you will like it. 1)Since the Honda wheel cover is held on by the lug nuts I loosened the lug nuts, raised the car, took off lug nuts, took off wheel cover and then replaced lug nuts and tightened to 80 ft-lbs. 2)Scrub the wheel cover thoroughly with dish soap, water and a soft nylon brush. Allow the cover to dry completely. 3)Spray the cover with prep solvent, and wipe it with a clean, lint-free towel. 4)Sand out any scratches or surface damage on the cover with 180- to 320-grit sandpaper. 5)Sand the entire surface of the wheel cover with 600-grit wet sandpaper until its surface is dull and smooth. 6)Scuff the wheel cover with a grey fine scuff pad. 1)Place the wheel cover on a drop cloth in a well-ventilated, preferably outdoor, area. 2)Spray two light coats of adhesion promoter for plastic parts over the surface of the wheel cover. 3)Shake the can of aerosol primer spray paint thoroughly, and apply at least three smooth, even coats. Allow each coat to dry for five to 10 minutes between applications. 2)Clean the sanding dust off the cover's surface with water and a lint-free towel. Allow the cover to dry. 3)Apply a color spray paint basecoat to the primed surface of the wheel cover. Apply as many coats as necessary for color matching and coverage. Allow each coat to dry for five to 10 minutes between applications. Allow the cover to dry for at least 30 minutes. 4)Spray on an even application of clearcoat. Wait five to 10 minutes for the clearcoat to dry. Apply three to four coats. 5)Apply a rubbing compound to the surface of the wheel cover 24 hours after the clearcoat has dried. 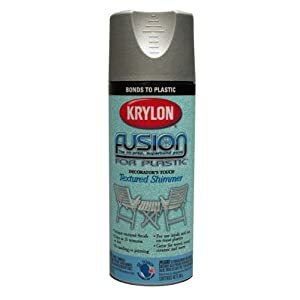 •Temperatures of 70 to 80 degrees Fahrenheit make for ideal spray painting conditions. •Test the paint on the underside of the wheel cover to make sure the color is what you're looking for. •Clean the nozzles of sticky aerosol spray cans by running them under a hot water faucet. Protecting wheel covers from dirt/dust? ?